The Commerce Department reported today that gross domestic product (or GDP, the widest measure of economic activity, equal to the final value of goods and services produced in the United States) rose at an annualized rate of 2.0% in the third quarter of 2010, up slightly from a 1.7% annualized increase in the previous quarter. Personal consumption expenditures contributed 1.8 percentage points to this quarter’s growth, while changes in inventories contributed another 1.4 percentage points. Net exports subtracted 2 percentage points, as imports continued to rise much faster than exports and residential investment subtracted 0.8 percentage points off the final growth figure. While trade flows were less of a drag on growth compared to the previous quarter, it seems clear that the trade deficit is poised to quickly regain its pre-recession level unless policy changes are made to allow the U.S. dollar to gain competitiveness against major trading partners. Given that a rising trade deficit will slow economic growth and job-growth over the next couple of years and is undesirable over the longer-run as well, this is a very troubling sign in the current recovery. Final demand growth (a measure of growth that strips out inventory changes) actually dropped compared to the previous quarter, rising at an annualized rate of 0.6% compared to 0.9% in the previous quarter. Domestic demand growth (final demand that adds imports and subtracts exports) was down markedly as well, falling from an annualized rate of 4.3% in the second quarter of 2010 to 2.5% in this report. Inflation-adjusted disposable personal income grew at its slowest rate since 2009. All of these measures, as well as continued very low inflation rates (the closely watched “market-based” measure of core inflation in personal consumption expenditures rose at an annualized rate of just 1.1%), indicate that the U.S. economy remains starved for aggregate demand. Even with the personal savings rate ticking down from 5.9% in the previous quarter to 5.5% in the current report, the economy is growing far below potential. Given that the combined underlying growth in the working-age population and productivity is in the neighborhood of 2.5% over the long-run, GDP growth of less than this is a recipe for rising unemployment. As of the third quarter of 2010, GDP remains 0.8% lower than it was in the fourth quarter of 2007, the pre-recession peak. 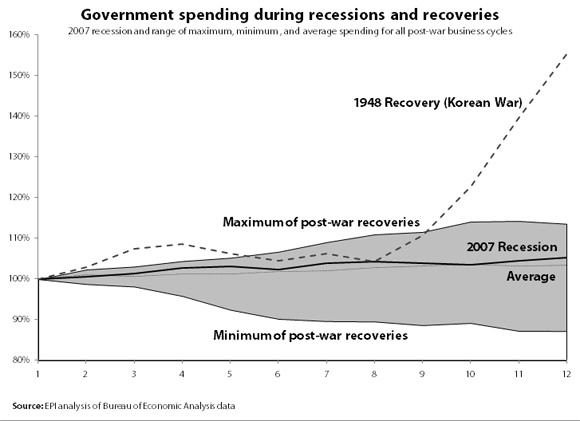 On average, the economy 11 quarters after a recession begins is 8.6% larger. 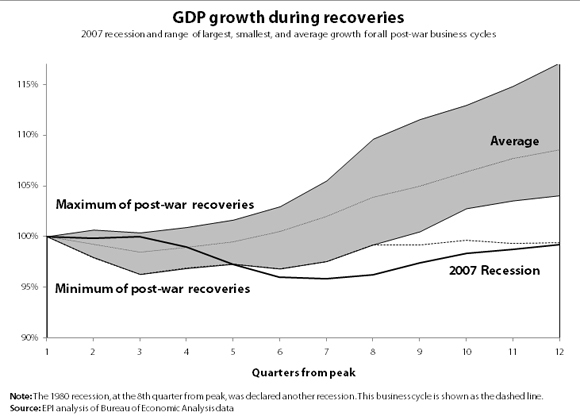 While this historically low GDP recovery is largely a function of the severity of the recession, we are now 5 quarters into recovery, and these five quarters have seen exceptionally slow growth—beating only the performance following the trough of the 2001 recession (among recoveries that lasted 5 quarters or more). Research assistance by Kathryn Edwards.